Above is my card. I used a stamp from Stampin' Up! 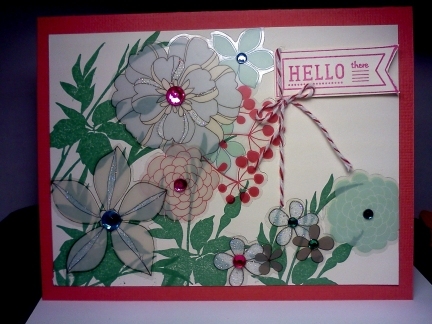 Fabulous Florets along with some sticker flowers I got last Christmas and a Unity stamp for my sentiment. I chose these sticker flowers beacuse they already had some bling going on! I love bling! I thought it was an interesting effect the way the flowers were semi transparent and you can see the stems and leaves through them. I felt that same way... how can I not have a sketch?! But your card turned out beautifully. I love all the layers and the vellum flowers. Thanks for joining us at Tuesday Morning Sketches. Very pretty card Betty. Thanks for playing along with us this week at Tuesday Morning Sketches. This is really pretty!! I love the vellum flowers! Betty, you're funny. Does make you go hmm. I love what you did though! Thank you for joining us this week at Tuesday Morning Sketches for our special challenge, "Anything Goes"! The layering of the vellum stickers over the stamping looks so pretty! Lovely card! Thanks for sharing it with us at Tuesday Morning Sketches!